This was a surprisingly delicious dish. It was even better the next day for lunch. I’m a big fan of broccoli, so I loved this twist on pesto that uses cooked broccoli instead of an herb. The lemon kicks this up a notch, adding a fresh, subtly tart note. I highly recommend this! Steam or blanche the broccoli until bright green and just tender. Shock the broccoli in a cold water bath to stop the cooking. Drain well and set aside. To make the pesto, combine 2 cups of the cooked broccoli, garlic, 1/2 cup pine nuts, Parmesan, 1/4 tsp salt, and lemon juice in the bowl of a food processor. Pulse until well-mixed. Add olive oil and Greek yogurt and pulse until smooth. 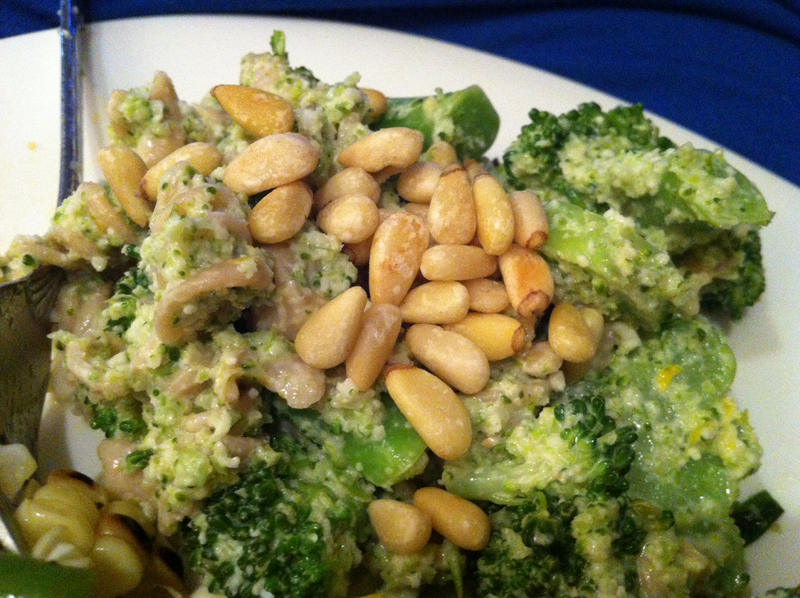 Toss cooked pasta, remaining broccoli, lemon zest and pesto in a large bowl, sprinkle remaining pine nuts on top. Serve immediately or refrigerate until ready to eat.